I pulled meat out of the freezer that had been cut for jerky and frozen to dry later. One package of elk was from 2001–a bit old after spending almost 7 years in the freezer–the outside layers were freezer burned pretty bad, but there was some good meat still on the inside of the pack. The bad 2/3 went to the pan and got cooked up for the dog and cat to eat. 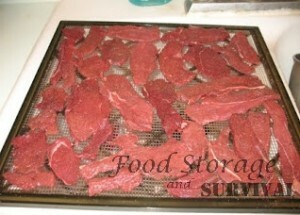 The good 1/3 went to the dehydrator with some deer from 2005–only about 3 years in the freezer. 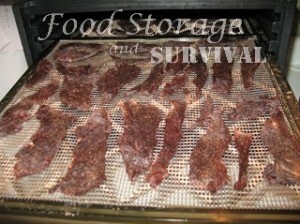 I’m no jerky expert, and there’s LOTS of ways to season and prepare the meat. Some people have a jerky press that spits ground meat out in nice even strips–I’m not that fancy. The way I do it is simple and only requires a nice sharp knife. Slice the meat thin but not too thin (no more than about 1/4 inch thick, but you don’t need it paper thin or it gets real dry and crispy). I did this when these animals were brought home from the hunt and then froze it already sliced. If you freeze the meat before slicing, it will slice best when it is still partially frozen. Try to slice as evenly as possible–just do your best, don’t go crazy with your micrometer here, close is good enough. Lay the meat on the drying trays and season BOTH sides. You can use salt and pepper, smoked salt, seasoned salt, whatever you like. Use a little more than you would on a steak. This is all to taste, so you’ll figure out how much seasoning you like. I’ve about killed it a few times with too much and too little salt, but it’s hard not to eat jerky so it got eaten anyway. 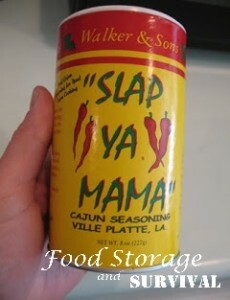 This time I tried some Cajun seasoning called Slap Ya Mama on half the jerky. I don’t like spicy or cajun seasoning, so I’ll have to wait until my husband tries it to give you a report on how it turned out. Update: 11/20–the Slap Ya Mama jerky is a hit. I even got talked into trying some. A bit spicy for me, but really good flavor. (My husband says it’s not spicy at all, just tasty–I just have crazy sensitivities to anything remotely spicy.) We’ll be making more . . .
You could also soak the meat in a marinade before putting it on the drying trays then you don’t need to season it on the trays. I did a teriyaki type marinade once and when my husband put it on the trays he salt and peppered it anyway! It was a strange mix of salt/pepper/teriyaki, but like I said, it’s hard not to eat jerky so it got eaten anyway. Throw it all in the dehydrator and dry until it’s done. The thinner pieces on mine were done in 6 hours at 145 degrees. Take them off and leave the thicker ones to dry longer. This is another item that doesn’t last long around here, so I can’t even tell you how long jerky is good for–it all gets eaten before it could possibly go bad. Yummy! Can I try some of this tomorrow too?